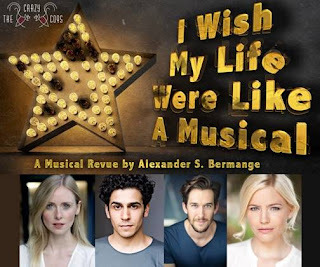 Cast announced for I Wish My Life Were a Musical at Crazy Coqs! Casting has been announced for I Wish My Life Were Like A Musical at Crazy Coqs on 9 – 15 & 17 April 2018. Suzie Mathers reunites with Wicked co-star Oliver Savile, along with Rocky Horror’s Liam Tamne and Diana Vickers, in this sparkling new comedic musical revue, created by Alexander S. Bermange and directed by Paul Foster. I Wish My Life Were Like A Musical sets out to present everything that you could possibly want to know about being a musical theatre performer… if only there were any who would dare to admit it. Created by iTunes comedy album chart-topper Alexander S. Bermange, and directed by Paul Foster – whose recent successes have included A Little Night Music at the Watermill Theatre and Annie Get Your Gun at Sheffield Crucible – this thrilling new musical revue comedically covers the journey from eager drama school graduate right through to brattish diva, or past-it chorus member, or bitter has-been (or “never-was”). Along the way, you will be privy to anecdotes, revelations and confessions – in song – that lift the lid on awful auditions, debilitating dance routines, mid-performance mishaps, and backstage backstabbing – alongside celebrations of those magical moments (however rare) that make it all seem worthwhile.